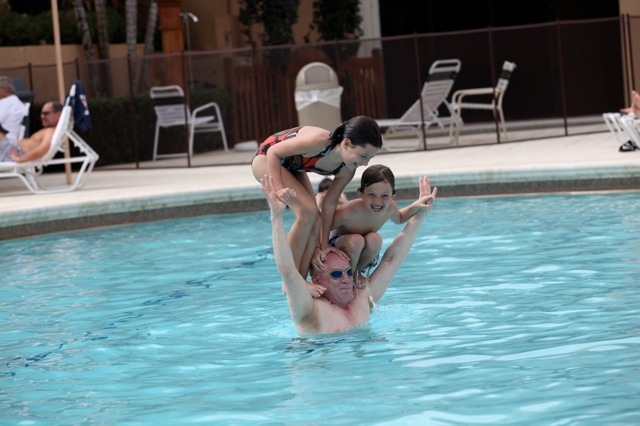 Geez, you go to Florida for a few days vacation and that is the time for a post to go viral? 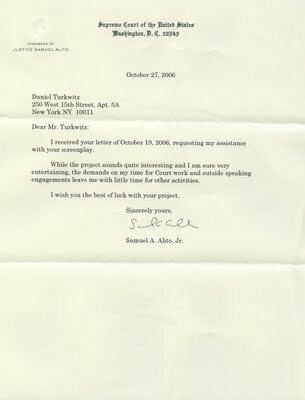 It seems the interest in Justice Antonin Scalia’s response to my brother Dan’s request for assistance on his screenplay, dealing with Maine seceding from the U.S., drew interest not only from legal blogs but from numerous political ones as well. Maybe I should have published all the responses? Thus far, over 23,000 page views for that one post. A little back story on w hy he wrote to the members of the court, over my objection, might be helpful. When he wrote his award-winning sci-fi thriller of astronauts stranded in space and fighting with each other for survival, he sought expertise on the plausibility of his plot. 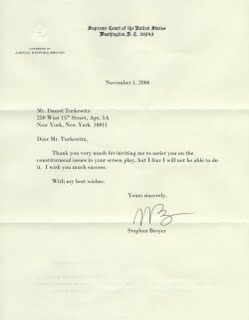 So he wrote to astronauts. And he got responses. If astronauts would respond to him, he figured, why not Supreme Court justices, especially given the lack of people that could speak authoritatively on the issue of secession? 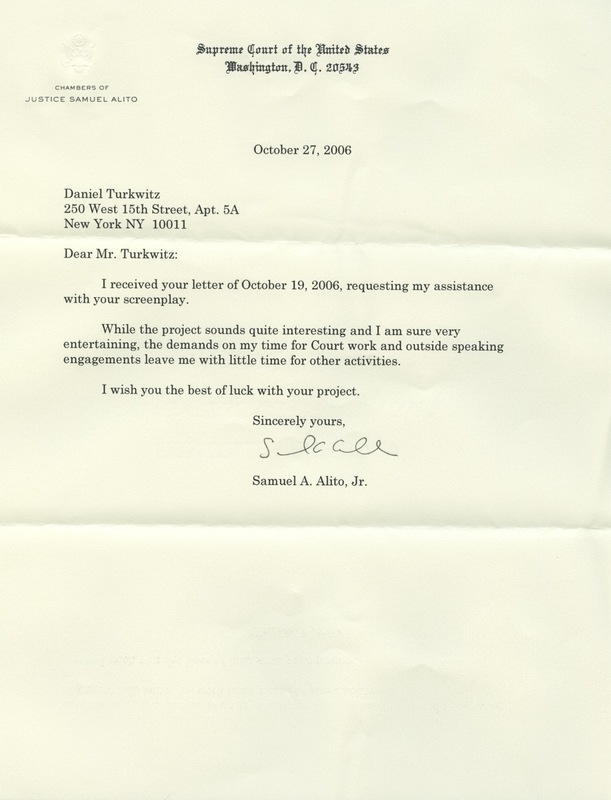 When I told him he wouldn’t get meaningful responses, I was right on 9/10 of the justices he wrote to. Scalia was the exception. But while Scalia was the only one to respond to the substance of my brother’s request, other responses did come in. He received three personally signed rejection letters from Justices Clarence Thomas, Samuel Alito and Stephen Breyer, which are all lovingly reproduced here. 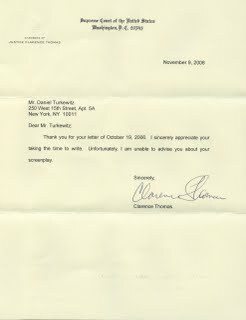 While reproducing rejec tion letters isn’t exactly the norm, these happen to be first rate, classy rejections. If you’re gonna get dumped, it might as well be by the best. Frankly, I was stunned that he even got these. And, as you can see, none of them are form letters. And they use top-notch stationary. Just in case you were wondering. Regardless of whether one agrees with Scalia’s political-judicial beliefs, the guy clearly picked up major cool points for giving my brother a substantive response. Justices Thomas, Alito and Breyer also picked up a few of those points, to the extent that they did take the time to respond, albeit with rejection. Justice Souter picked up a single point for having a secretary respond. On the flight back from Florida I pondered a question: Is there any significance to the fact that the responding troika of Scalia-Alito-Thomas form 3/4 of the conservative wing? I’ll leave it to others to opine on that subject. I think that you're the one who needs an agent. Blogger uncovers Scalia secrets, goes viral and becomes consultant on how to write multi million dollar blogs that are covered by major media outlets. Seriously – congrats on the great coverage. But I have one more I'm working on, that goes directly to the second issue that Scalia raised: How does the issue of secession even get before the court? Hopefully, it will be ready tomorrow morning. All great responses, but Alito misspelled your name — ouch! 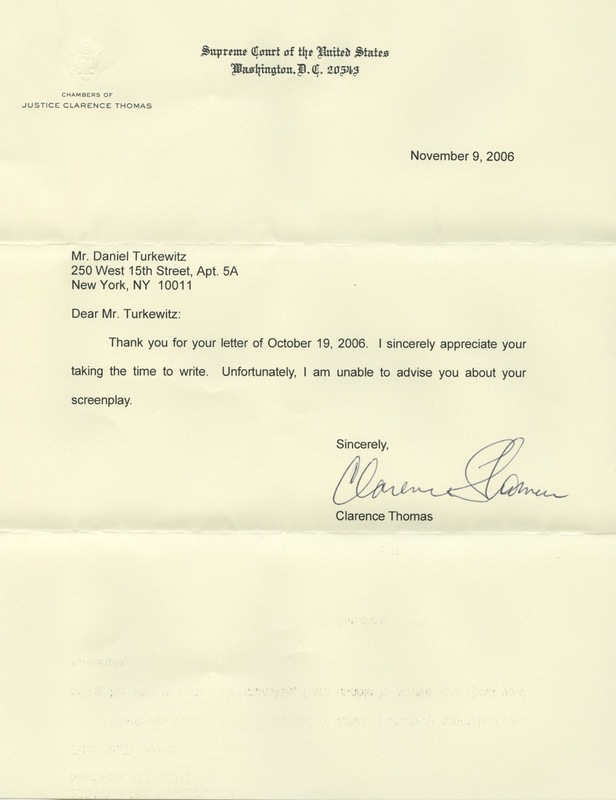 I suggest responding, State of the Union-style: "'Turkwitz??' Not true, Justice Alito, not true."